Parades are almost a given at any Homecoming celebration, and the University of Illinois at Urbana-Champaign is no different. 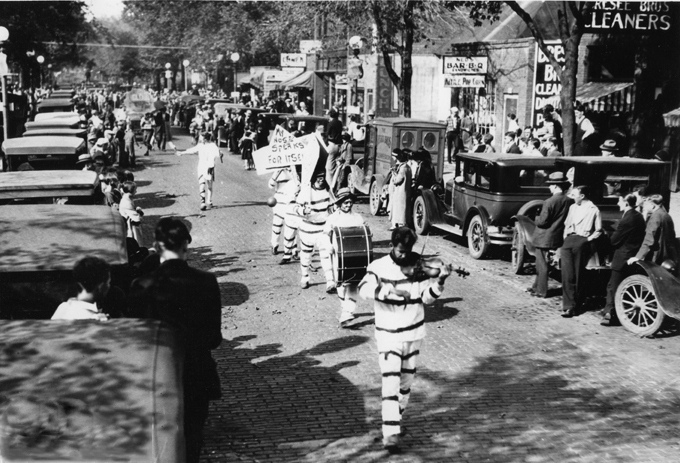 However, in the early years of the 20th century, Illinois Homecoming weekend featured something other than floats: the Hobo Band Parade. 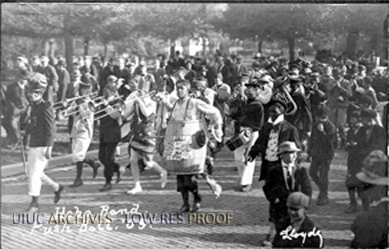 The actual origin of the Hobo Band Parade is lost to history; however, the tradition had already been established on the U of I campus for many years by the early 1900s, actually predating the Homecoming celebration it became associated with. It was traditional for seniors to dress as a hobo, clown, or other character, grab an instrument, and lead the way to Illinois Field for the annual Freshman-Sophomore pushball game. 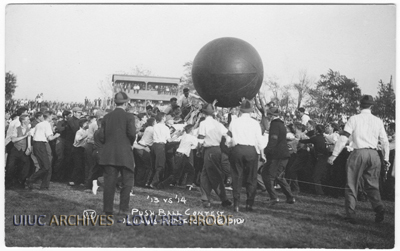 In 1910, the pushball game became part of the program of activities for the First Annual Fall Homecoming, and the senior class Hobo Band came along too (1). 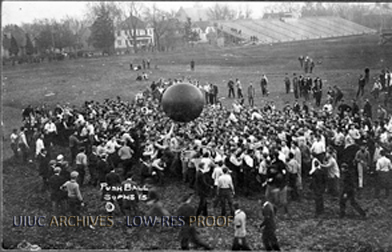 In 1913, sack rush replaced pushball (2). 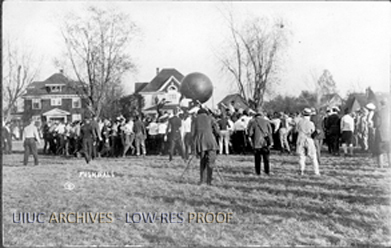 The annual pushball game and other “class scraps” fell out of favor in the 1910s (3), but the Hobo Band Parade marched on for 37 years as an annual Homecoming tradition. The Hobo Parade was eventually dropped from Homecoming festivities; no football program or Daily Illini makes mention of it after 1946. It is difficult to say why. It has been suggested that masquerade-type entertainment simply went out of style, and that post-WWII campus culture was a little less silly than before (4). 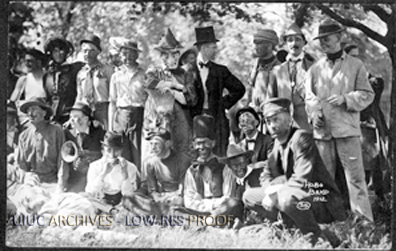 John Franch writes that the Hobo Parade was cancelled in 1934 due to lack of interest (5). Similar traditions existed at other universities, and some even continue to the present day (6). 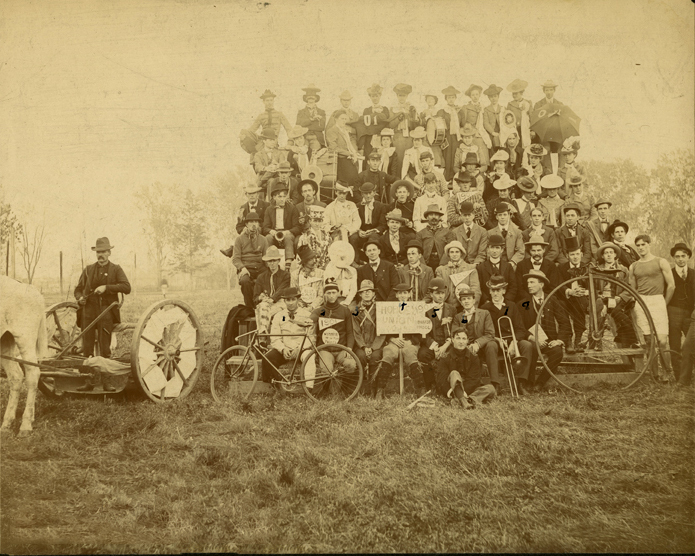 However, after 66 years, it seems UIUC’s Hobo Band is relegated to retirement. Freshmen push ball team that won in 1910, posing for a picture: Image courtesy the University of Illinois Archives Found in Box 1, Folder 101-201 Image Number: 171, Record Series 39/2/24. Students play push ball, 1906: Image courtesy the University of Illinois Archives Found in Box 1, Folder 101-201 Image Number: 164, Record Series 39/2/24. 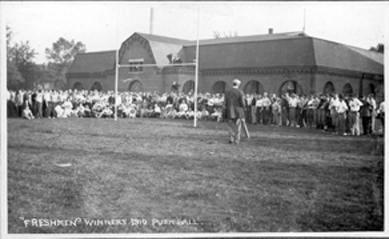 Push Ball contest on the football field in 1910 : Image courtesy University of Illinois Archives Found in Box 1, Folder 101-201 Image Number: 168, Record Series 39/2/24. 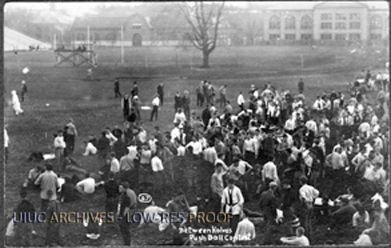 Ground shot of the push ballers in action, 1909: University of Illinois Archives Found in Box 1, Folder 101-201 Image Number: 167, Record Series 39/2/24. 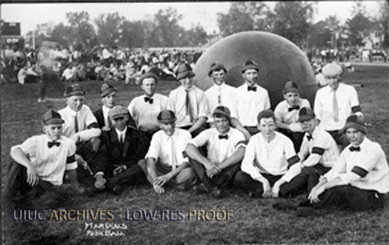 Competitors hang out between halves at the Push Ball competition, 1909: Image courtesy University of Illinois Archives Found in Box 1, Folder 101-201 Image Number: 166, Record Series 39/2/24. 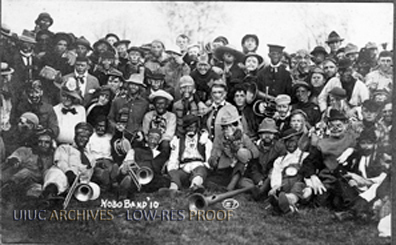 The Hobo Band poses for a picture in 1910: Image courtesy University of Illinois Archives Found in Box 1, Folder 101-201 Image Number: 201, Record Series 39/2/24. The Hobo Band of 1912 poses for a picture: Image courtesy the University of Illinois Archives Found in Box 1, Folder 101-201 Image Number: 196, Record Series 39/2/24. Portrait of the push ball marshals of homecoming 1910: Image courtesy University of Illinois Archives Found in Box 1, Folder 101-201 Image Number: 170, Record Series 39/2/24. 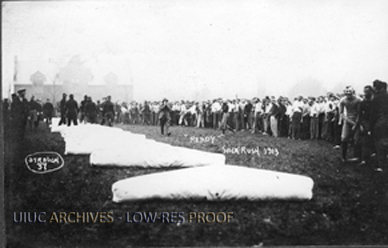 "Ready" - Sack Rush, 1913: Image courtesy University of Illinois Archives The freshmen and sophomores get ready to start the Sack Rush of 1913 Found in Box 1, Folder 303-389 Image Number: 347, Record Series 39/2/24. 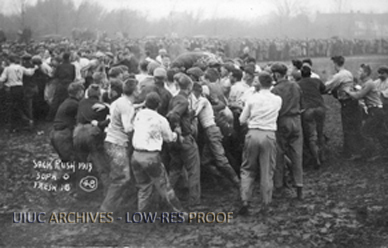 Sack Rush, 1913: Image courtesy University of Illinois Archives The freshmen beat the sophomores 18-0 in the Sack Rush of 1913 Found in Box 1, Folder 303-389 Image Number: 346, Record Series 39/2/24. 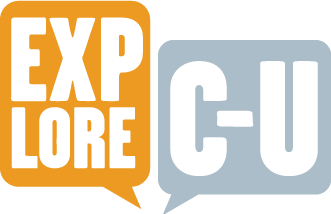 Rory Grennan, “Homecoming History: Hobo Band Parade and Other Traditions,” ExploreCU, accessed April 20, 2019, https://explorecu.org/items/show/256.